A play posing as a performance piece that purports to be about health issues but which is more fundamentally about familial ones. The main character of this self-conscious theatrical experiment is named Lisa Kron (Sebastian Ryder), same as the playwright. She engages the audience immediately in the presumption of the awareness of putting on a play which she casts as an investigation. To the right of the main space on the stage which Lisa predominately occupies sits the character of her mother, Ann (Lisa Foley), who becomes an integral part of the action. Much of the preliminaries involve discussion of allergy, the investigation and dramatization of the clinical attempt to identify the character’s allergies, and the subsequent involvement of various characters, medical and otherwise, with the protagonist and her mother. 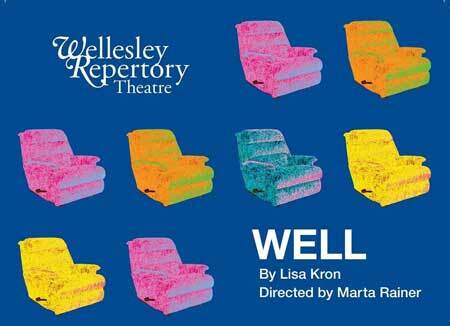 Some plays take down the fourth wall; Lisa Kron’s pretension in this unbridled attempt to be completely straightforward is to not only create herself as the central character in this play but to talk about it at considerable length with her mother and with the other characters. To call this self-conscious writing would be to underestimate the constancy of the effects of being reminded that this is a portrayal of the playwright’s concerns. That Kron wrote the lyrics to Fun Home, the very successful musical based on the autobiographical graphic novel by Alison Bechdel, is not a huge surprise. That, as well, is an autobiographical story told in a similar, though not as self-conscious, way. There, however, the subject is not Kron herself but Bechdel, which removes much of the self-consciousness which infects Well. There are some very funny lines in the play and it is the placement of those throughout that give it some punch. At the outset, Kron talks about the frustrations of dealing with her mother, feeling that your parents live in an alternate universe where therapy has no power. It’s a hilarious line. As well, in describing her mother, Kron says that she is an extremely energetic person trapped in an exhausted body, an observation that is at once quite poignantly accurate and devastatingly funny in an offhand way. The two things we believe in as a family are allergies and racial integration, says Kron, bluntly and perspicaciously, not pulling any punches while trying to evoke a vision of her mother’s passions. Kron mentions that her Midwestern family is Jewish, which leads to a couple of additional prize observations: the assumption in the Midwest is that though you’re a Jew you’re also a Christian, and that In the Midwest, Judaism is regarded as a kind of addendum. At one point, Kron says that this Well is not meant to be a well-made play but a theatrical exploration. Fair enough. That self-reflective observation is indeed quite true and makes the experience of it both interesting and a bit taxing. The actors are all energetic and committed. Sebastian Ryder, as Lisa Kron, and Lisa Foley, as her mother, both put in good effort to bring the characters to life, and succeed quite well, despite the endless self-reference, in realizing an vulnerably intimate tenderness in their relationship.